The advent of E-commerce has made lives easy for many of us with hectic schedules. We can shop, book tickets, and even manage to make our day to day transactions including banking as well. Just imagine sitting at your desk and getting your money transferred from one account to another in a matter of clicks. Well, to say the least definitely possible and hardly takes any time and is safe too. And the best part, you needn't even have to visit your bank. If we talking about State Bank of India, transferring money online from your account to another account of the same Bank happens in a jiffy, in fact, it is as fast as sending an Email. If we talk about online money transfer from your SBI account to another Bank account, then that is also not a difficult task to manage. You just need to follow some simple steps and it will be done. You can use this method to transfer money to HDFC, Punjab National Bank, Axis bank, union bank of India, IDBI Bank, and all other Indian banks. First, you have to register for SBI internet banking using a Debit card to transfer fund online. If you already have SBI net banking account, then follow the steps given below. Step 1. 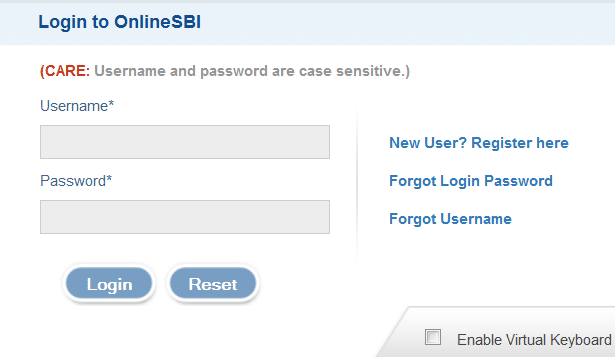 The first step is to log in to your internet banking account on OnlineSBI Internet Banking website https://www.onlinesbi.com. If you are new user open an account with SBI bank, you will get a booklet specifying detail as to how to create an Internet Banking account. You have to collect booklet manually from your SBI branch. Step 2. Before you initiate a transfer to other bank accounts via your SBI account, you need to first add the payee as beneficiary. For this, you should go to the Manage Beneficiary link under the Profile tab. You have to add the intra-beneficiary account for SBI to other SBI money transfer. Now you need to fill in details like Name, account number, Address and IFSC code. Post doing so, click on submit. Now, you would need to wait for up to a day maximum for the bank to approve the beneficiary. Once the beneficiary has been approved by the bank, its status will turn out to be active. Step 5. Once the beneficiary status turns to active, you need to click on 'Payment/ Transfer' from the top menu. 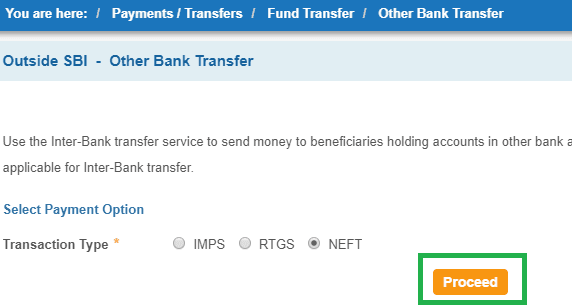 Step 6: From the list of fund transfer options, click on 'other Bank transfer' located just below outside SBI. Step 7. The next step is to select the payment option from amongst NEFT, IMPS or RTGS. I prefer NEFT, so select NEFT as a payment option and click on proceed button. Step 8. The next step is to then select the Beneficiary name, choose any purpose, accept terms & conditions and enter the amount to be transferred, click on submit button. You might need to verify your details once again, and you must make sure all the details are correct and hit the submit button. Step 9. One time password will be sent to your registered mobile number. Enter OTP and click confirm button to complete the ongoing transaction. This essentially completes the process from your end. The money will be credited to the beneficiary/payee’s account within 8-24 Hours. If you have initiated the fund transfer in non-working Days, then it will be scheduled for next working Day. As highlighted above, transferring money from one account to the other in an interbank transaction is so easy. The best part is that you needn't even go to your Bank branch. The process is both hassle-free and secure too. Moreover, your Internet Banking account summary on the SBI bank website will have all the details of transactions undertaken. The tabs are very self-explanatory and easy to navigate. So sit back, relax and easily do your banking transactions online in a matter of minutes. Sit I want to transfer money from sbi to central bank of India. 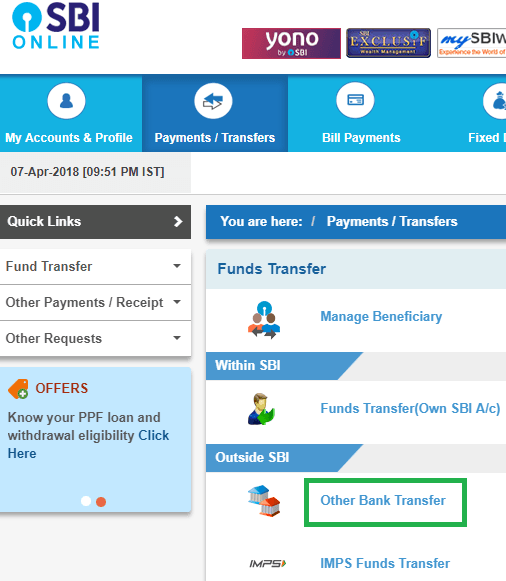 How I transfer money from sbi to axis bank by sbi online banking? Yes you can... if you have allahabad net banking account. You can use PAYTM instead of netbanking. I WANT KNOW OUR CURRENT ACCOUNT BALANCE THRU INTERNET FROM SBI WITHOUT INTERNET BANKING REGISTRATION. I WANT SBI ACCOUNT TRANSFFER FROM SBI CHILKA TO SBI FORT MUMBAI. How much time it will take to transfer money from sbi to axis bank through internet banking. I would like to transfer money from Sbi to my bank of Baroda account(international bank) with branch's India is it possible online? If yes how is it done? I would like to transfer money from Sbi to my bank of Baroda account(international bank) with branch’s India is it possible online? If yes how is it done? Thanks!! Will surely try today! Yes it is possible, Just visit your home branch and submit application regarding this. They will update new number. Yes sir Steps are given in above articles. How to transfer money from state bank of India to union bank of India. I want to transfer money form sbi to Allahabad bank .it is possible .if it is possible so please send me steps . Steps are same. You can transfer money to any banks in India. United Bank of India to all others bank money transfer business network service. Check my sbi acount balance online my mobile no 9571006028.
sir I want msg alert on mobile No 8859035506.
hi i am snehangsu patra..is it possible to transfer money from icici to sbi atm. Please reply.